While everything is going online under e-governance project, many of the Indians have started taking advantage of the same. At this PAN Card portal, you will get every information that you want to know about your PAN Card. Following our guidance, you can download your PAN Card Application Form for free.You can download PAN card application form from NSDL and from UTI portals as well. Applicants will get all guidance here for downloading the required application form. We have also given links that will direct users to the official sites of UTI and NSDL. Application forms are also required if you want to get correction in it. There is also a PAN Card correction form available to rectify any errors in the PAN Card. Instructions and links shared in this post will help users to get their relevant application form easily. Other useful information about the PAN Card Application Form is also shared at our site. As you might be aware, PAN Card is now a mandatory document while opening a bank account in India. You need to link your bank account to PAN Card as well as Aadhar Card. The latter is not mandatory though. PAN card can also be applied by foreign citizens in India. Different forms are to be submitted for correction and application. Hence the below shared details will help you to get the correct PAN Card Application Form as per your requirement. Once you apply for PAN Card, you can also check the status of your application online. PAN Card Correction Form – This form is for requesting a new PAN Card (for existing PAN no.) or corrections/changes in existing PAN Card Data. Applicants can fill the forms online at any nearest TIN Facilitation Centers managed by NSDL. You can search for your nearest TIN Facilitation Centers or PAN Centers at NSDL site. TIN Centers receive applications for PAN and TAN numbers. They also receive TDS returns, annual information returns from income tax return filers. You can also easily check TIN NSDL PAN status online from one of our previous guide. If you wish to apply for a new PAN Card, use below links to download the appropriate form. The PAN Card Application Form for the existing PAN number or for correction/s in the existing PAN Card is known as CSF at the UTI portal. CSF – For requesting change or correction in existing PAN Card. 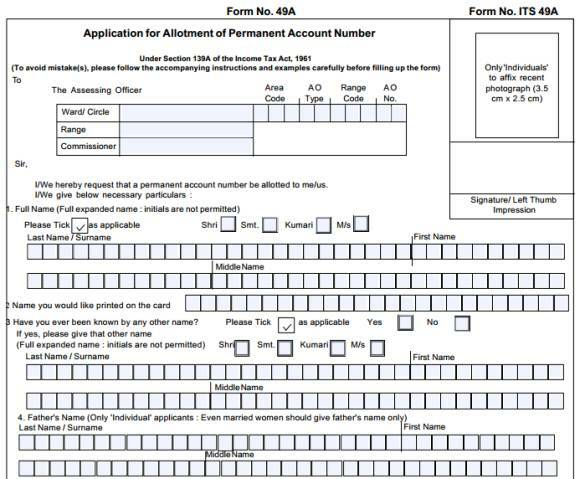 This form should also be used when you want to get a new PAN Card for your already existing Permanent Account Number. This facility will be useful in case your PAN Card is lost or damaged. Instructions for filling up the application forms are available for all the above forms. You can also follow how to fill PAN Card guide in case you are struggling to fill up the above form. Following the guidelines given in the form makes it simple for applicants to fill up the form. If you have applied for a PAN Card through UTI portal, then you can know your UTI PAN Card status as well. Examples of some of the identity proofs that you can submit are- driving license, Aadhar Card, Ration Card with applicant’s photo, Voter ID Card and Copy of Passport. Other Identity proof include Arm’s license, Pensioner Card and Certificate of Identity. To curb any kind of duplicity and fraud, Government is now providing facility to link PAN Card with Aadhar Card. Paying taxes have become extremely easy as PAN Cards are now linked to your Aadhar Card. If your Aadhar Card number is linked to your PAN Card number, you can pay your taxes without sending your ITR V acknowledgment. Learn how to get Aadhar Card status by name or number. Please browse our site through the search option for any particular information you are looking for. We have posted on PAN Card status and PAN Card verification too. We are sure to make it easy for you to get the appropriate PAN Card Application Form. Our site is dedicated to guide Indian citizens to use the online facilities with regard to Permanent Account Number. Regd.No.RJ 054060767IN Dared 03/05/2016 ka abhitak generate nahi hua h pl.jald generate karane ka last karenge. Thank you so much sir for this application form……. Vill-Dadwa, Post-Kuriyar, Thana-Munderwa, District -Basti UP.